I love going to Whole Foods! I don’t know what it is but the minute I park I get this gitty feeling, like a kid going to Disneyland. Maybe it is the fresh Kombucha on tap I start my shopping adventure with or being able to leisurely walk down the aisles (I should mention I go after my kids are asleep) surrounded by healthy food or just the simple fact of knowing that I am walking amongst like-minded people. Either way, I love this place! Now, what I don’t love so much are the prices and how I always seem to pay triple digits, even though I only have 3 or 4 bags full. If you follow my blog on Facebook, This American Mama, then you know I love doing product reviews and sharing new recipes and health tips. Since I try to make most things from scratch, many times I will buy a product once and learn to replicate it so that I can save money and make a healthier version. I love being inspired and getting new ideas from my shopping adventures! 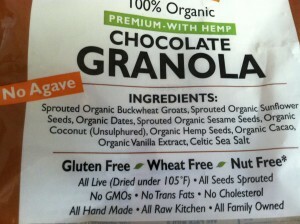 This past week I discovered a product called “Go Raw Chocolate Granola“. What caught my attention was that they had the ingredients in bold letters on the front of the package. That right there earned my respect! I fell deeper in love when I saw it was gluten and dairy free and didn’t contain any sugar or agave. 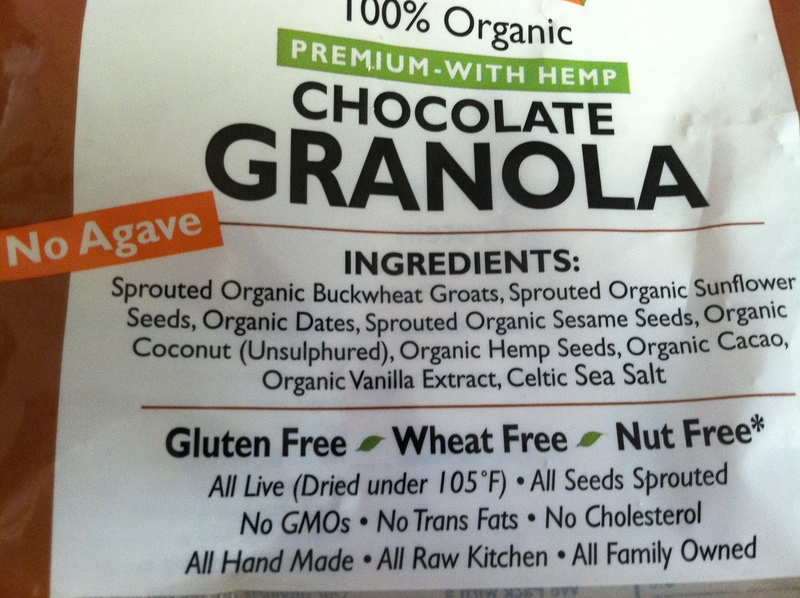 Plus it was organic, made with hemp (which I love) and had my favorite ingredient ever….Cacao!!! I was curious what this tasted like since I am not familiar with buckwheat and since”sprouted organic buckwheat groats” was the 1st ingredient I was intrigued. We keep a gluten free house so I feel that buckwheat and I should know each other by now. I also love that it was high in fiber, full of vitamins and contains 5 grams of protein (per serving). I brought it home, threw some in a bowl, added some qunioa milk and was in heaven! Wow, did it taste great. The next morning I added it to my smoothie, I loved it! 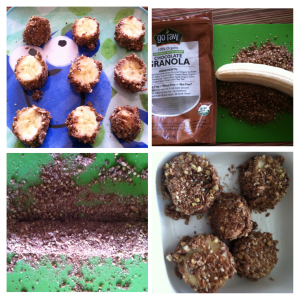 Today I made a quick, healthy snack with the granola and my kids went crazy for it. This takes literally 2 minutes to do and they acted like I gave them homemade chocolate cake (gluten, dairy, sugar free…of course :)! I rolled a whole banana in the raw granola, sliced it up and gave them a few pieces each. You can sprinkle the rest of the granola on top of the slices if you want. They begged me for more! I made another batch, and stuck the slices in the freezer for tomorrow’s afternoon snack. The slices taste great frozen too!